The global viscosity index improvers market is prognosticated to witness a positive growth curve in forthcoming years, reports Transparency Market Research (TMR). The market’s competitive landscape features a veritable pool of established market players. The vendors in the market are expected to capitalize on opportunities offered by emerging industries such as the booming automotive sector, the marine industry, and manufacturing processes. 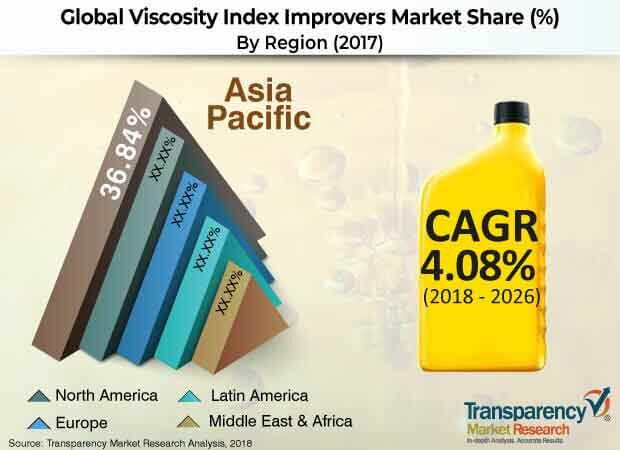 Vendors in the global viscosity index improvers market are expected to focus on research and development for improving their product portfolio, launching novel and innovative products. Technological advances in viscosity index improvers are expected to open up growth opportunities in for vendors in the market. Key vendors operating in the global viscosity index improvers market include The Lubrizol Corporation, Chevron Oronite Company LLC, Evonik Industries, Nanjing Runyou Chemical industry Additive Co., Ltd., and Sanyo Chemical Industries. According to TMR analysts, the viscosity index improvers market was estimated to be worth US$ 3.02 Bn in 2017. Over the forecast period of 2018 to 2026, the market is projected to expand at a 4% CAGR. Among the type segments, the demand for olefin copolymer is expected to remain high over the forecast duration. This could be attributed to the segment already accounting for a 45% share of the overall market in 2017. In the same year, Asia Pacific held more than 35% of the global share in the global viscosity index improvers market. The high sales of automobiles in the region could play a key role in the strengthening of this regional market, bolstered by the rapidly growing automotive industry in countries like China and India. At high temperatures, mineral oil lubricants are less effective as heating reduces their viscosity and the capacity of film forming. In certain applications, the traditional solution to this problem was to make seasonal oil changes. This is no longer necessary or desirable when the viscosity index improves. The improved lubricant viscosity index helps the lubricant blender achieve the required substantial characteristics, such as reducing the tendency of lubrication to change when temperatures fluctuate to protect equipment at extreme temperatures. Viscosity index improvers reduce the dependency of lubrication viscosity to change temperature increase or decrease. Viscosity enhancers are two key features, shear stability, and thickening efficiency. All of these can be achieved by selecting proper viscosity index improvers to achieve excellent fuel efficiency, durability, and performance. The application of an improver viscosity index achieves maximum efficiency, improves even at low temperatures and protects the equipment against harmful usage. Over the forecast period, increasing adoption of technology in the viscosity index will capture maximum market share with regard to sales. The positive key drivers expected to propel the global demand of the market-enhancing viscosity index are the significant advantage associated with the use of viscosity improvers and increased demand from the end-use industries. The relatively high cost of raw materials on the global market is expected to hinder market growth, one of the key factors. The demand for fully automated systems and green products are likely to emerge as key trends boosting the global viscosity index improvers market.